It’s been a difficult Advent for us at Morton this year as we struggle with sickness and death. Our hearts yearn for God’s comfort. Thanks be to God, divine comfort is on the way. Here is an Advent sermon for people who need to be comforted. “Are you the one we’ve been waiting for?” No wonder John the Baptist sent that word to Jesus. John was longing for the Messiah to set the world on fire, gather the wheat, burn the chaff, make things the way they ought to be, thy will be done, O God, on earth as it is in heaven. But that hadn’t happened yet. And now John was chained in King Herod Antipas’ dungeon. Prison was a place of great suffering even for someone as tough as John, who dressed in camel’s hair and was used to eating insects. It was dark and damp and teeth-chattering cold. John’s disciples brought food to keep him alive; otherwise there was nothing to eat. Prisons didn’t provide luxuries like food. Prisoners depended on the mercy of people outside for food. It looked like John was probably not going to live to see his dream fulfilled. Who knew when Herod might issue the execution order? If Jesus really was the Christ, the Messiah, why didn’t he get on with things? What was Jesus waiting for? I can’t blame John the Baptist at all for his urgent question: Are you the one, or must we wait for another? People who know what desperation is know what John was getting at. In a place of pain, the heart questions. This happens even to people of the strongest faith, like John the Baptist; like Lucy Rose, the Presbyterian pastor I told you about many months ago. You might have met Lucy when she did a student in ministry year in the early seventies at First Presbyterian Church in Rocky Mount . Great children’s books are great for God’s children of all ages. Union Presbyterian Seminary now has a web site called Children’s Literature: A Resource for Ministry . You will find book reviews, lesson plans, and other ideas for using children’s literature in ministry. You will even find books that correlate with lessons from the Revised Common Lectionary. Here is a children’s book that I treasure in my story archive: …And Now Miguel, by Joseph Krumgold, winner of the 1954 Newbery Medal. Twelve-year-old Miguel longs to accompany the men of his family on the annual sheep drive to the Sangre de Cristo Mountains. He longs to be treated like a man, not a child. This book is written in the first person, and in chapter four Miguel describes what happens at lambing time. With hundreds of ewes and hundreds of lambs, it is difficult to tell which lamb belongs to which ewe. Miguel helps his family paint numbers on them. 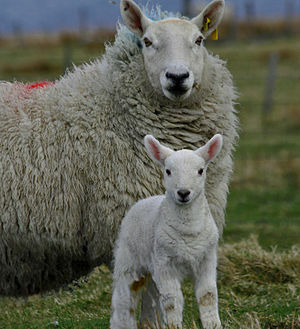 Each ewe and her lamb are marked with the same number. This story reminds me of the matching numbers that my newborn daughter and I wore in the hospital. It’s a story to think about the next time somebody asks you what 666 means.